2013 Press Pass Gameday Gallery Football is all about autographs and prospects. 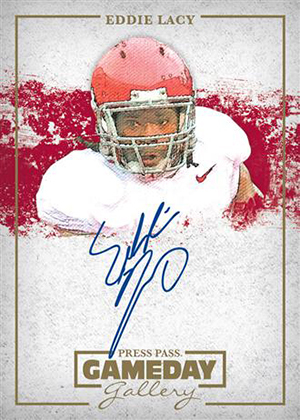 In fact, there's nothing but autographed prospects in the product. Every 2013 Press Pass Gameday Gallery hobby box has one pack of four cards. All are autographs from key 2013 draft picks. The design uses a bold artistic flair that enhances images and have splashes of color. Cards are numbered to 199 or less. Parallels include hobby-exclusive one-of-ones. 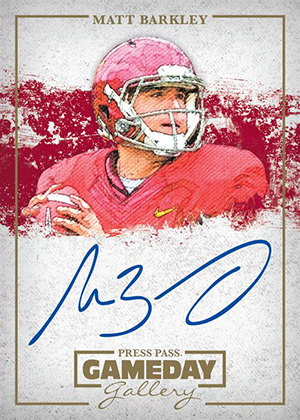 Eight of the best prospects, including Geno Smith, Matt Barkley, Eddie Lacy and Mike Glennon have rare variation autographs that use different images. 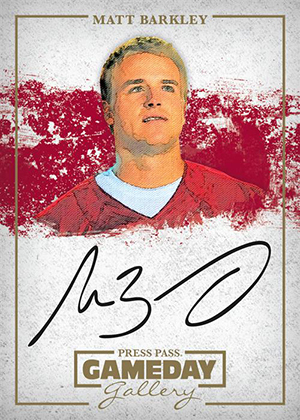 Click here for the 2013 Press Pass Gameday Gallery Football checklist. 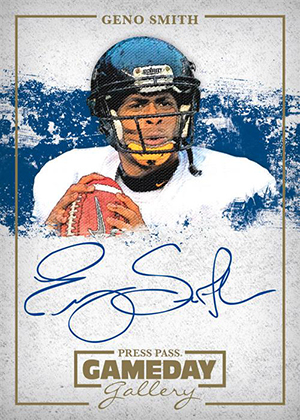 Besides the 2013 Elite hobby box purchase today, Mrs. Toshi and I have also purchased ’13 Press Pass Gameday Gallery. It has a very unique design and an interesting drawn photo of each player. Unlike the draftees of 2012, we will need to be patient in regards to this years rookies in there success within the NFL. The four auto cards we pulled were of Zac Dysert, Alec Ogletree, Deandre Hopkins, Andre Ellington. All cards were numbered to 99. This is the first time we’ve ever purchased a hobby product of Press Pass. Our past purchases of Press Pass normally are from a retail store. Will I buy this next year? No. Would I recommend this product? If you’re a auto collector, I would definitely recommend this product.